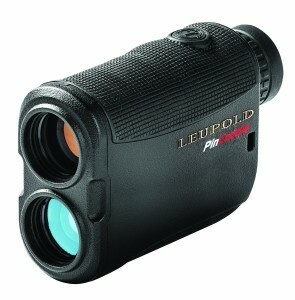 The Leupold PinCaddie features 6x magnification and a high contrast LCD dis play. It also features a multi-coated lens system, one-touch scanning mode and provides measurements in yards and meters. The brand’s celebrated PinHunter technology eliminates false readings, caused by background surfaces such as trees, by displaying the distance to the closest object in the crosshair. PinCaddie is suitable for obtaining line-of-sight distances only, making it legal for tournament play. Reasonable Price:The Leupold PinCaddie is one of the least expensive Leupold laser rangefinders. Weatherproof:The weatherproof construction makes it safe to use during inclement weather. Lacks Prism Lock:Other models in the Leupold line feature Prism Lock that freezes the target distance when displayed and emits a sound once the device has picked up a prism or flagstick. The PinCaddie lacks this feature. Black LCD Screen:Many units offer a red OLED display while the PinCaddie features a black LCD screen that can be hard to read against dark backgrounds. The Leupold PinCaddie is a vertically-held device weighing 7.2 ounces. It is lighter than many other rangefinders but still larger compared to a number of models in the Leupold lineup. It features just a single button that works to turn the device on, fire the laser and change between yards and meters. The display is a black LCD that features a slight green tint in the lens. The black LCD is a bit of a downgrade compared to competing rangefinders and other Leupold models that offer a red OLED display. Pressing the power button once turns the unit on, while pressing it again fires the laser. Holding the power/fire button prompts the device to pan across the landscape to acquire multiple targets. The distance display blinks when the laser is fired and the distance is shown above the crosshair. This is inconvenient, however, as the black LCD information is often placed against a dark background where trees are concerned, making it difficult to read. The distance is shown for 5 seconds after the firing button is released. The PinCaddie offers a normal 6x magnification. This may be seen as a bonus considering many lower priced units only offer 5x magnification. The device is one of the simpler laser rangefinders in the Leupold lineup as it lacks most of the more complex features found in other models. It still has the necessary features for a laser rangefinder, however. The PinCaddie also provides the ability to switch between yards and meters. It features a weatherproof construction and a PinHunter mode made to assist in locking on to targets instead of objects in the background. Leupold states that the unit can provide distances to flagsticks at up to 250 yards and 600 yards for reflective prisms under optimal conditions. It performs well up to 175 yards where performance drops slightly. It can still perform well enough to return flagstick distances against harder backgrounds at 200 yards, but experiences more difficulty from 225 yards on. There is no function to lock on, such as Prism Lock that is provided on most of the Leupold rangefinders. To scan targets the user can pan while holding down the fire button or fire at each target, as the laser can be fired for over a minute. Readings will show on the display for approximately 5 seconds after the firing button is released. The PinCaddie can be purchased for barely over $200, making it one of the most inexpensive USGA-compliant rangefinders available. The compromise, however, is its limited feature set. While it performs well against models at its price point, it could be better compared to other Leupold models.